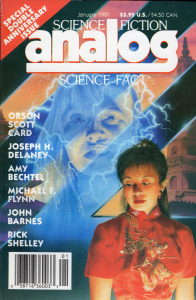 Description: Before ‘Xenocide’ was written as a novel, it was partially published in the January 1991 issue of Analog Magazine as a short story. This original publication includes 97 pages of text and black and white pictures. Parts of ‘Gloriously Bright’ are reprinted as chapters 1, 3, 5, 7, 9, and 11 of ‘Xenocide’. It also includes about 20 paragraphs recounting Jane’s story from ‘Speaker for the Dead’ that are not republished anywhere else in the Enderverse. You can view full scans of the text, here.